In various areas throughout the United States, the cost of water is rising quickly. In fact, the cost of municipally supplied water has increased an average of 25 percent over the past five years alone. In the desert Southwest, water costs can be as high as $1,300 to $1,800 per acre-foot (approximately 325,851 gallons). Considering the amount of water it can take to maintain a golf course in that arid region, superintendents there could potentially pay more than $1 million annually to water their courses. In some cases, water is the single largest line item in their budgets. However, it’s not just the drier, more drought-prone regions of the country that are now paying more for potable water. Residents of Cleveland are now paying 120 percent more than they did 10 years ago. Other cities, including Atlanta, Portland, San Francisco and San Diego, have experienced price increases ranging from roughly 140 percent to over 200 percent during that same period of time. Why are water prices increasing in such a dramatic fashion? Higher demand and the costs associated with filtering, delivering and pumping water to homes and businesses have contributed to these significant increases. 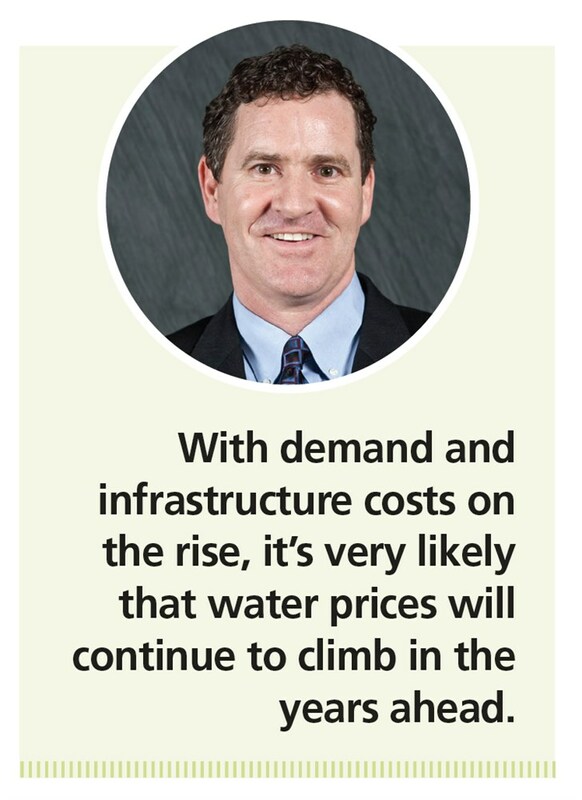 With demand and infrastructure costs on the rise, it’s very likely that water prices will continue to climb in the years ahead. While outsiders may consider golf courses to be “water wasters,” the fact is that most superintendents are extremely shrewd when it comes to water use and are some of the best water managers in the world. Having learned from experience, many superintendents are now proactively developing plans to help them manage a limited water supply during times of water restrictions or drought. The use of effluent water – also known as reclaimed or recycled water – from water treatment facilities has also grown as a result of rising water prices. Just 20 years ago, some utility companies couldn’t even give this type of water away. Today, in many parts of the country, the demand for reclaimed water is very high and pricing has increased dramatically, too. However, it can be a real challenge to get this water supply to golf courses without installing large and very expensive pipelines. For those courses for which effluent water is a viable option, it’s important to have irrigation system components designed and labeled for use with this harsher water. Effluent water also typically requires filtering or chemicals to remove suspended solids or to address pH or salt-related issues that can affect turfgrass. Perform an irrigation system audit. Understanding your irrigation system’s water distribution uniformity is the first step toward improving it. An experienced certified golf course irrigation auditor can test several areas of a course and report uniformity, as well as document any maintenance or component issues that are negatively affecting your system’s overall efficiency. Install a meter on every water source. Most modern irrigation systems allow users to view every water meter from their central control systems. After all, if you can’t measure it, you can’t manage it. Use a weather station. Weather stations are key water management tools that provide on-site data on plant evapotranspiration rates. Central control systems can work with weather stations to calculate the appropriate run times for each station. Understand how much water is available within the soil. Implementing in-ground and portable soil moisture sensors can help superintendents determine the amount of water present in their course’s soil. From there, you can further refine your watering schedules to meet the exact needs of the course’s turf and plants. Create and follow a system maintenance check sheet. This sheet should list all routine maintenance procedures necessary for a high-performing irrigation system. Correctly performing regularly scheduled maintenance can cut water use by 10 percent or more. Consider wetting agents and surfactants. More courses are using these compounds to hold moisture in the soil and manage isolated dry spots. Replace turfgrass with native grass or plants. This is one way to reduce the amount of water a course requires without affecting its playability. While water prices will continue to rise, there are many steps you superintendents can take to maintain beautiful, playable courses without breaking your budgets. The key is being proactive. Regardless of whether water is currently expensive in your area, it’s important to develop a plan that can sustain your course should prices spike or water restrictions go into effect.